Creating art for people I care about is always a pleasure for me. A couple of months ago I started a small painting of Pansy flowers for my piano teacher. She has a lovely yard, and in the late Spring months she had Pansies blooming on her front porch. They were beautiful and lots of different colors, mostly yellow and purple. Those happen to be my two favorite colors to paint together. I intended to take my camera with me when I went for a piano lesson one day and take pictures of her pansies. But I just kept forgetting it. Then by the end of May I decided I wanted to take a break from my lessons for the summer. So I never did make it over there to take the pictures. 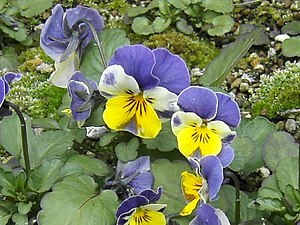 Instead, I found a picture of pansies and just used it to learn how to draw them. Then I decided to make a small painting of some. It took me a couple of months to plan it, draw it lightly onto my watercolor paper, pick out the right color paints, paint the flowers, get the matting, have my husband cut the matting for it, and frame it. But it was a fun project. I liked the way it turned out. However, I forgot to make a copy of it before I gave it to her. Oh well. The Pansies were pretty difficult to draw and paint, but I enjoyed the challenge. My favorite part of doing this project, though, was giving it to her. She was surprised and pleased. And of course she asked me if I was still playing piano. I am still playing, but not every single day right now. I have so many different interests that take time, I find it best to concentrate on one thing at a time. Sometimes that is hard for me to do, but right now I don’t have any art projects going, so my yard is taking priority. I hope everyone is having a fun and safe summer. Stay cool, and give someone you love a hug today. Posted on July 25, 2013, in Art Talk and tagged acrylics, painting, watercolor painting. Bookmark the permalink. Leave a comment.